He’s the only author ever to have a No. 1 New York Times best-seller in the fiction, nonfiction and paperback fiction categories. His syndicated radio show airs on more than 400 stations, his Web site and Web casts are thriving, and his live comedy performances are jam-packed. Why, and how, is Glenn Beck resonating so powerfully with a huge swath of the American people? 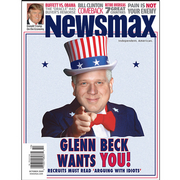 Newsmax magazine takes an in-depth look at the “Happy Warrior” Glenn Beck and reveals how he rose to prominence — and has become such an enemy of the Obama White House and the establishment media. This insider report on Glenn Beck includes an exclusive, wide-ranging interview with the media sensation who befuddles critics, rallies voters and draws back the curtain on low deeds in high places. In his interview with Newsmax, Beck reveals his worst fear: that a “Reichstag moment” — a catastrophic event may soon take place so that the powers that be in Washington can end the Republic and our cherished Constitution. Beck insists he’s not fear mongering — but he is personally afraid for the United States. What inspired Beck’s best-seller "Arguing With Idiots"
Iraq: Another disaster in the making? Bill Clinton gets his groove back: Will Obama call him? Singapore’s healthcare system offers lessons for U.S.
Ben Stein: Why force rich and poor to mix? 2009 October Magazine: Glenn Beck Wants You!